Cognitive abilities are important for the economic and non-economic success of individuals and societies. For international analyses, the collection of IQ-measures from Lynn and Vanhanen was supplemented and meliorated by data from international student assessment studies (IEA-Reading, TIMSS, PISA, PIRLS). 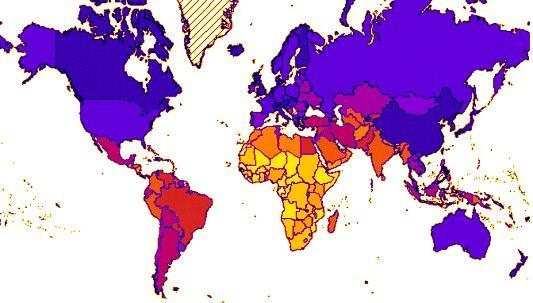 The cognitive level of a nation is highly correlated with its educational level (r = .78, N = 173). In international comparisons, it also shows a high correlation with gross national product (GNP, r = .63, N = 185). However, in cross-sectional studies, the causal relationship between intelligence and national wealth is difficult to determine. In longitudinal analyses with various samples of nations, education and cognitive abilities appear to be more important as developmental factors for GNP than economic freedom. Education and intelligence are also more relevant to economic welfare than vice versa, but at the national level the influence of economic wealth on cognitive development is still substantial. The results reported here show that during the last third of the 20th century, education and cognitive abilities were more important for economic wealth than economic wealth was for education and cognitive abilities. This result is stable across the different national samples of education and ability and remains after adding additional factors like economic freedom. Intelligence is even more important for wealth than economic freedom (see also Weede, 2006)! Whereas the importance of intelligence for many personal life outcomes has been recognized for some time (Gottfredson, 2003 and Herrnstein and Murray, 1994), we should realize that intelligence is also an important determinant for the economic and social development of nations (for example the functioning of institutions in the systems of law, economics and politics). The present study shows that a high level of cognitive development can be an antecedent and likely cause for economic growth, but other macro-social outcomes (e.g., democracy, rule of law, national power or health) are likely to be influenced by education and intelligence as well (Rindermann, submitted for publication and Rindermann, submitted for publication). Certainly the positive influence of young people's schooling and intelligence on the level of economic freedom 30 years later (Fig. 4 and Fig. 5) deserves further investigation. Future theoretical and empirical research has to analyze the causal mechanism underlying the effects of ability on development of societies in a more detailed manner. For example, there is a positive relationship with low government spending ratio (r = .47 and rp = .24). Abilities seem to enable a more liberal economic constitution and thriftiness of state interventions. Conversely, a population with low education and intelligence seems to necessitate more state intervention, which tends to widen the influence of powerful special-interest groups. So higher IQ populations tend to be more libertarian? A re-colored version of Figure 1 -- a world map -- is below the fold.